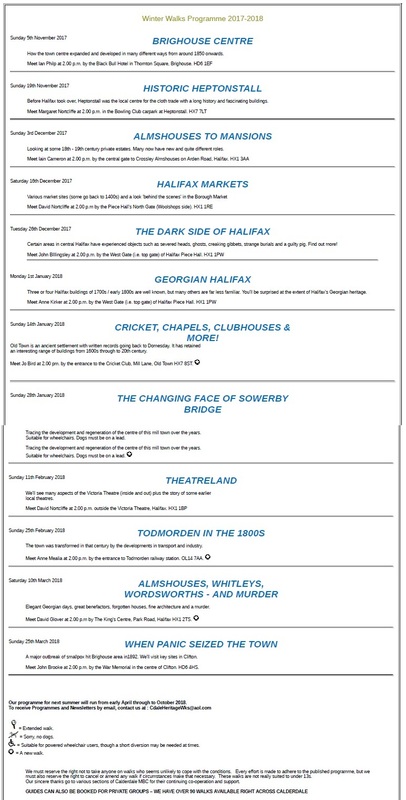 Calderdale Heritage Walks’ winter programme has fortnightly walks plus an extra one at Christmas. No pre-booking required, just turn up and pay the Guide – it’s £3 (all ages). Old Town is an ancient settlement with written records going back to Domesday. It has retained an interesting range of buildings from 1600’s through to the 20th century. Meet Jo Bird at 2pm by the entrance to the Cricket Club on Mill Lane, Old Town, HX7 8ST. The complete Winter Walks Programme as shown below and can also be downloaded here. This entry was posted in Health & Wellbeing, Local News on January 8, 2018 by calderdaleforum50plus.